Q. Why don't you have live phone support available? A. Unfortunately, we do not have the personnel to answer phones constantly. Many of the questions being asked are easily covered with a sentence of explanation and these can handled on the website. Plus the website is available 24 hours a day. Q. Can I get a tracking number on my order? A. We do not have an interface on our website to provide you tracking numbers. You need to make this assumption when ordering: All orders are usually shipped the next business day after they are received. All orders are shipped out of Oklahoma, so however long it takes UPS to get to your state from Oklahoma is how long it will take for you to receive it. Remember: You control the shipping in the checkout process. Q. Can I use a credit card other than VISA or MasterCard? A. We are only setup to receive MasterCard or VISA. Q. If I am ordering for a school, can I order on credit with a purchase order? A. No, we are not setup for terms orders. School coaches will need to use their own Visa or MasterCard and then request reimbursement from the school. Q. Can you ship outside of the continental US? A. Yes, but the shipping on our website is not setup for this, so you will have to email us so we can calculate the shipping. We will notify you of the new shipping total so you can approve in advance. Q. Can I ship to a PO Box? A. No, UPS will not ship to a PO Box, so if you must provide a physical address or your order will not be processed. We use UPS exclusively for our shipping. Q. Are your scorebooks the ones with both teams on the same page? A. Yes, both our 100 game and 30 game scorebook BOTH feature both teams on the same page. Q. Do you have a catalog you can send us? A. No, we do not have a catalog. We only have three products -so a catalog really isn't necessary. Everything we have to offer is available on our website. Q. Are there instructions inside the scorebook to help a new scorekeeper? A. Yes, the inside cover of both the 100 game and 30 game book have great instructions. Q. How many lines do the scorebooks provide for players? A. There are 12 lines provided for players. Q. Why is the 100 game book larger in size than the 30 game book? A. The 100 game is 17 x 11 and the 30 game is 14 x 10 and the 100 game book gives you a column down the center (between the two teams) for you to make notes. The 100 game also comes with a thicker backing which is useful when using your lap for notation. Q. Can I pay with a check? A. Yes, you will need to use the website to calculate your total with shipping and then take the total and write out your check made payable to "Ultimate Scorebooks." Mail the check to: 7039 E. 40th Street, Tulsa, OK 74145. Be sure to specify on your check what you are purchasing. Q. Are the line-up cards provided as part of the scorebook? A. No, our line-up cards are sold separately as 4 part carbonless items that ship 25 to a pack. Q. What is the scorebook cover and backing made out of and how is the book bound? A. The front of the 30 game & 100 game books are laminated cardboard and it is spiral bound with a plastic coil. The cardboard front & backing on the 30 game is laminated cardboard but it is a thicker cardboard backing on the 100 game book just due to the larger size of the book. Q. Can I make a purchase without a credit card? A. Yes. We can process your order without a credit card. Please follow the steps below to complete your order 1] Go onto the website and start the process to purchase a scorebook. NOTE: As soon as the website gives the total with shipping then they will can exit out of the website. 2] Write out a check for the amount of the order plus shipping and make the check payable to: Ultimate Scorebooks 3] Mail the check to: Ultimate Scorebooks 7039 E. 40th Street Tulsa, OK 74145 Once we receive the check, then we will send out the order. Q. How do I return merchandise? A. Please return merchandise to: 7039 E. 40th Street, Tulsa, OK 74145. Once we receive the merchandise, then we will credit your account for the cost of the items. We do not credit shipping costs, because those are paid to UPS for services rendered. Q. How can my store become a reseller? Q. How can I be setup on 30 day Terms? A. We only allow terms if you purchase over 100 scorebooks in a single order. Otherwise you will need to use a MasterCard or Visa to process your order. Q. What do we get with a custom scorebook cover? A. You are allowed a full color logo of your store and three (3) lines of text. Q. How long does it take to get a custom cover order delivered? A. It takes 14 to 18 business days to print a custom scorebook order, then you will have shipping time on top of that. Q. What are the costs to have a custom cover? A. There is a one-time $50.00 setup charge per each type of scorebook. We have two scorebooks - 100 game and 30 game and the covers are different sizes, so there are separate charges for each type of scorebook. The most you will incur in your order would be a one-time $100.00 setup charge. Custom cover orders take 14 to 18 business days to print and then your shipping time on top of the lead time needed for custom printed covers. Q. Can I use my own UPS shipping account to ship my order? A. We do not have procedures in place to allow outside shipping accounts. We are a small company and our shipping department is structured to process orders in mass quantities and this does not lend itself to custom shipping instructions. Q. Can we customize both the scorebooks and the line-up cards? A. You can only customize the 100 game and 30 game scorebooks. The line-up cards are not large enough to customize. Q. What is the minimum size order required for resellers? A. Resellers are required to place a minimum order of 25 scorebooks in any combination. Q. How large will my logo be on a custom imprinted scorebook cover? A. Your own information will be imprinted inside our covers and we recommend you send us your logo and 3 lines of text. The area allotted for you will be 3.75 inches high and 8 inches wide. 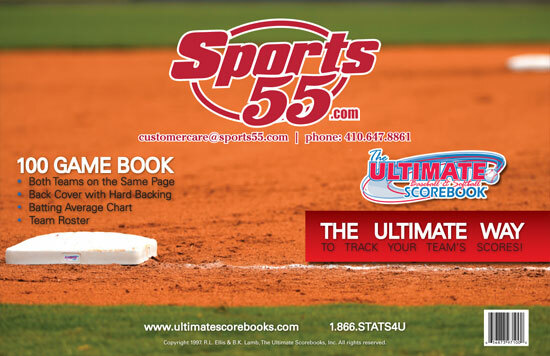 The best way to explain this is to show you an example of a customer’s custom cover imprint – see Grand Slam Sports branding inside the Ultimate Scorebooks cover.